It's not about style tonight...it's about staying warm! Just as meteorologist Eric Nefstead talked about this weekend the start of 2013 will be anything but warm! Clouds will be in abundance this morning and afternoon as snow falls in central and southern Illinois. A cold front passing through this morning will drop temperatures from the 30s into the low 20s and teens by this evening. If you're New Year's Eve plans take you out tonight don't worry about style, just worry about staying warm. By 7pm the mercury will drop to 18° and by the time you're ready to ring in the new year we'll be down to 14°. By daybreak Tuesday we will have fallen all the way into the single digits as high pressure moves in and skies clear. Wind chills tonight will also be an issue as some will wake up to chills as cold as -10°! Stay warm and Happy New Year! A pair of weather systems over the plains are approaching from the west and northwest tonight. The first system has pushed a warm front into the Stateline, and temperatures have risen into the low 30's across the entire area. It is a unusual for the high temperature for the day to occur at night, but it does happen from time to time during the winter when a warm front moves in from the southwest. It reached 32 degrees in Rockford at 10 pm under cloudy skies with a brisk southerly wind at 14 mph. Temperatures are in the low to middle 30's to the immediate south and west of Rockford extending into eastern Iowa. So, the high temperature on Monday will most likely occur after midnight. Steady temperatures will hold then though daybreak. A cold front will move across the area switching winds to the west, and then northwest. Daytime temperatures will be in the middle 20's falling to the low 20's by 4 pm with a northwest wind 10 to 15 mph under mostly cloudy skies. The second front further to the northwest will dissipate allowing cold air from Canada to overspread northern Illinois on New Year's Eve. A bubble of arctic high pressure will be near Fargo, North Dakota as of 6 pm. Northerly winds east of the high will bring in much colder air from Canada overnight. Skies will become partly cloudy with drier air moving in, and it will be much colder with an overnight low near 4 degrees. Wind chills could be as low as -5 around daybreak on New Year's Day. The arctic high will move to near Omaha, Nebraska by 6 am on Tuesday morning. Skies will be mostly sunny in Rockford, and the high temperature will only be around 13 degrees. So, as the calendar turns over into the new year of 2013, our region will be seeing the coldest temperatures so far this season. The high will move to near Moline, Illinois by 6 pm on Tuesday setting the stage for another cold night. It will be mostly clear, and winds will be light. The low will be around 3 above zero late Wednesday night. An Alberta Clipper System over North Dakota will charge rapidly toward the southeast overnight reaching Quincy, Illinois by 6 am on Thursday morning. The system will be moisture starved so no measurable snowfall is expected. However, it will be mostly cloudy on Thursday, and some light snow and flurries cannot be ruled out. The high will be near 24 degrees on Thursday. The pattern will be changing so that the high pressure that follows in behind the departing Clipper System will not be from Canada. It will be a bubble developing on the eastern flank of Pacific high pressure sitting over the inter mountain west. It will slide to the southeast on Friday to Texas. Skies will be mostly sunny with chilly temperatures on Friday with a high in the low 20's. That cold, but not drastic. On Saturday a couple of Canadian fronts will push in from the north. Skies will be partly cloudy, and temperatures will continue to moderate because no frigid Canadian air will follow in behind the front. The high on Saturday will be around 27 degrees. The weather will be much the same on Sunday. A weak system moving across the Great Lakes on Saturday was responsible for widespread cloud cover. There was a little snow associated with the system, but accumulating snows were limited to mostly to Wisconsin, and amounts were generally less than 3 or 4". Just a dusting, to a couple of tenths of an inch, were recorded across northern Illinois. The clouds associated with the system have moved off to the east tonight leaving the sky illuminated by a just past full cold moon. It is very bright out tonight with the moonlight enhanced by the areas snow cover. A modified arctic high sprawling across the south central states ridges up across Iowa to our west. Now that skies have cleared, the temperature will be able to dip down into the single digits overnight. The low will be around 8 degrees with a west wind around 10 mph. The high will move to Kentucky by noon on Sunday, and will continue to dominate our weather with mostly sunny skies and chilly temperatures. The high on Sunday is expected to be only around 24 degrees. The wind will shift around to the southwest at 6 to 12 mph. With a southerly breeze in place on the back side of the high on Monday night in advance of re-enforcing cold fronts over the northern plains, the Stateline temperatures will remain steady overnight on Monday night holding around 23 degrees. The new cold front will proceed southeast across our area by noontime on Monday. No moisture is available for this system, so no snow is anticipated. It will be mostly cloudy, though, with the max temperature occurring in the upper 20's before dropping back in the afternoon. Canadian high pressure will slide in across the northern plains to a position over Minnesota by 6 pm on Monday evening. With mostly clear skies the temperature on New Year's Eve will drop to around 7 degrees overnight. The cold high will be over nearby Iowa early Tuesday. Skies will be mostly sunny, and it will be cold with a high only in the middle teens. Another system will approach rapidly from the northwest on Tuesday night. On Wednesday the system will stretch from a weak low over lower Michigan though another low over northeast Iowa, and continue as a cold front across northwest Iowa and northern Nebraska. There may be enough moisture and upper air support to squeeze out some light snow as the system moves through the area on Wednesday night. It should not be much, and no measurable snowfall is anticipated at this time. Lows will be in the single digits again Wednesday, Thursday, and Friday nights. Highs will only be in the upper teens Thursday and Friday. Temperatures are expected to warm up a bit into the upper 20's on Saturday in advance of the next front dropping in from the northwest. 11:00 am Update: The snow falling earlier this morning has come to an end across northern Illinois but continues to lightly fall from Janesville northward. As the upper level low passes later today we may begin to see a little more snow develop for this afternoon but any further accumulations will remain minor. About a half an inch to a little over an inch of snow has fallen so far. 8:00 am Update: Light snow now beginning to fall from Janesville, Rockford, Dixon and Rochelle this morning. The falling snow may briefly reduce visibility if heavier snow bands develop. Light snow is beginning to blossom on the radar this morning, however, a lot of this isn't reaching the surface just yet. A dry layer in the atmosphere a few thousand feet above the surface is causing what snow that is falling from the clouds to evaporate. It'll take some time for the atmosphere to become completely saturated to support snowfall later this morning and afternoon. While this shouldn't cause too many headaches in northern Illinois there have been a few reports of slick roads on untreated surfaces northeast of Janesville. As the falling snow works to saturate the atmosphere there may be a brief period of freezing drizzle mixed with those flurries north of the state line. Watch for slick spots if your commute takes you north this morning. Looks like a little bit of winter weather in the forecast for Friday. Here's everything you need to know for our next storm system. Timing: Things look pretty quiet for the overnight Thursday. A few flurries will be possible, with increasing snow chances around daybreak. The latest models are showing snow showers moving in closer to midday now, but we'll say snow is possible starting Friday morning and going through the evening before tapering off heading into Saturday morning. Totals: This isn't expecting to be a major storm. The snow we're expecting will be very fluffy, which could boost accumulations through the afternoon. Looks like a few inches will be possible Friday, with heavier totals to our north. Southern Wisconsin could see 3-4" in some spots. Impacts: While it won't be a lot of snow, it looks like we'll see enough to make for some slick spots and messy roads. With temps being so close to the freezing mark Friday, some of our snow could melt and refreeze and temps drop Friday evening. Long story short... take it easy on the roads. Orange Bowl Travel: If you're heading down to Florida on Friday to get a jump start on Orange Bowl festivities, be prepared for a few bumps in the road. Aside from snow locally, a wintry mix is possible for parts of southern Illinois and western Kentucky/Tennessee with showers in the forecast for the rest of the south. Air travel to Florida might also be delayed slightly with Friday's snow, although flying will be much smoother than driving. Cloudy skies stick around for another day while a little more sunshine will be seen just to the west. While we bypassed a significant storm to the south it looks like an upper level low spinning in the Plains Thursday morning will move through the Great Lakes Friday bringing with it accumulating snowfall. Snow falling in Nebraska and western Iowa will move east this evening and tonight with light snow developing after midnight to the west and overspreading northern Illinois and southern Wisconsin by midday Friday. Accumulations don't look to be significant but snowfall totals could fluff up to 2" inches in far northern Illinois possibly nearing 3" inches further north in Wisconsin. South of Rockford totals will remain less than an inch. Security cameras at a Walgreens captured the tornado that ripped through Mobile, AL on Christmas Day. Notice the cars still on the road, someone in their vehicle in the parking lot and the customers in the store. Too close if you ask me. That's why it's so importmant to have a severe weather plan in place and know what to do when severe weather strikes! Heading down to Miami to check out the Huskies play Florida State at the Orange Bowl New Year's Day? This post is for you! Fortunately, it doesn't look like there will be many travel issues for anyone going to the game. Let's start with Thursday. With the Ohio Valley dealing with a major snowstorm today, there could still be snowy roads and slick spots in parts of southern Illinois, Indiana, and western Kentucky. Just take it easy if you're hitting the roads early. A few snow showers are possible Friday for the Stateline, but it shouldn't cause any major travel headaches for those heading to Florida. A few showers will also be possible to our south Friday and Saturday, but once again, it doesn't look like it will cause any major travel headaches. Sunday through New Year's Day is looking pretty quiet for everyone, meaning anyone heading to the game at the last second should be fine. As for the game itself, it's looking like pretty standard Miami weather for the start of 2013 and the kickoff of the Orange Bowl. Looks for highs around 80 and plenty of sun. Kickoff temps will be in the low 70s with a shower possible later in the evening. A weak disturbance may cause a little light snow and freezing drizzle through the early afternoon. The surface map shows a weak low over southern Indiana with a trough of low pressure stretching northwest from the low across northern Illinois into southeastern Minnesota. Circulation around the low will cause winds to be northeast around 10 mph today. The skies will be cloudy today with a high in the low 30's. It will remain mostly cloudy overnight, and the low will be in the low 20's. A massive ridge of arctic high pressure extends southward out of Canada through the Dakotas, eastern Nebraska, eastern Kansas, across Oklahoma into central Texas. The extremely cold weather associated with the ridge remains limited to Montana, the Dakotas, into northwestern Minnesota where temperatures were -5 to -10 early this morning. 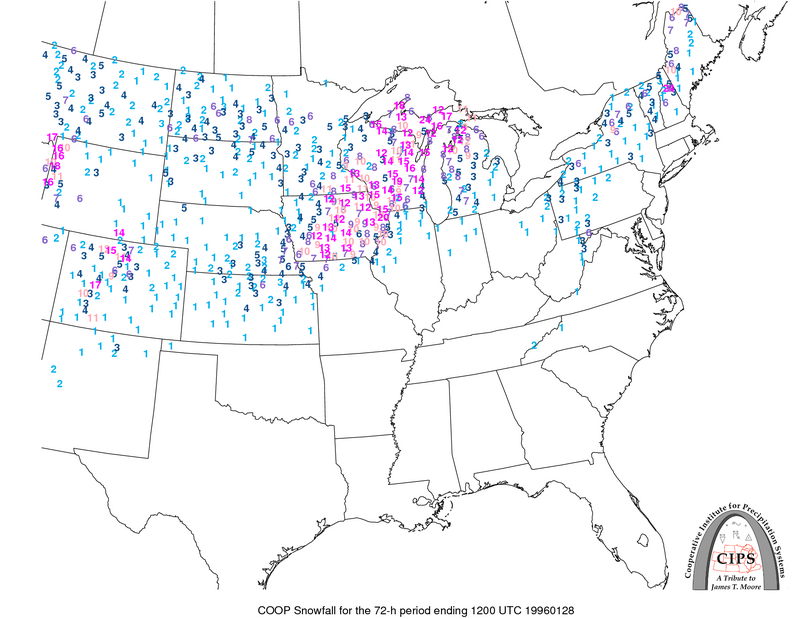 The good thing is that there does not seem to be any indication that the severe cold will move into northern Illinois. Temperatures this week will be pretty close to seasonal averages. It will continue to be mostly cloudy on Christmas Day with a high around 26 degrees. The wind will pick up from the north at 10-15 mph. The southern jet stream will activate, and start to spin up a storm system over east central Texas early Christmas morning. The low will intensify as it moves to western Mississippi by 6 pm on Christmas Day, and it will be very intense by the time it moves to north central Tennessee by 6 am Wednesday. Winter Storm Watches have been issued from Oklahoma eastward across northern Arkansas, southern Missouri, southeastern Illinois, across Indiana into western Ohio, and south central lower Michigan. Heavy snow could occur anywhere in those areas. Because of the intensity of the low, and the tight pressure gradient between the low and the arctic ridge over Minnesota, strong northerly winds will buffet the Stateline on Wednesday. 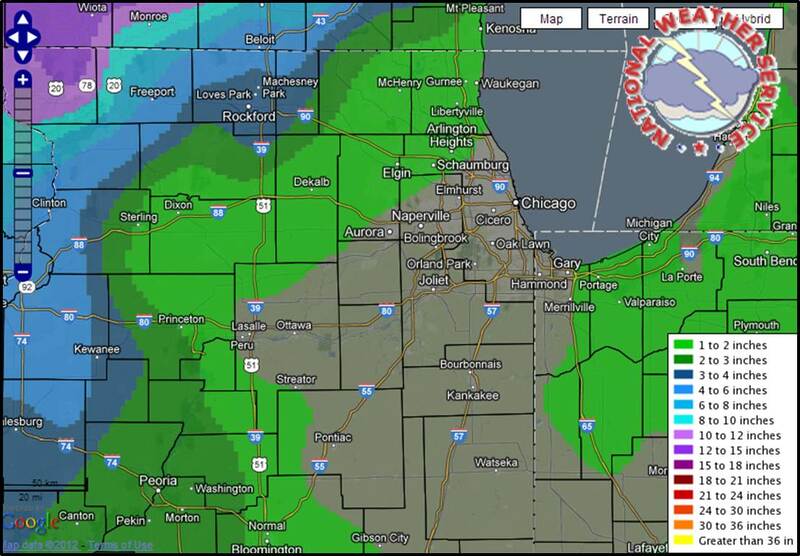 It will be cloudy, but no snow is expected across northern Illinois on Wednesday. The storm will continue to speed off to the northeast on Thursday spreading strong winds, and heavy snow across northern Ohio, northwestern Pennsylvania, and most of New York State into parts of New England. It will remain mostly cloudy on Thursday in northern Illinois with a high in the middle 20's. The wind will die down as the ridge moves over the area. On Friday low pressure will develop again over Texas. An inverted trough of low pressure will extend northeast of the low into Iowa early Friday morning. It will become cloudy as the trough approaches, and there is a chance of some light snow with a high in the low 30's. The trough will move across the area on Friday night with a good chance of some snow. Clouds will persist on Saturday with a continuing chance of light snow. The high will be in the upper 20's. High pressure will take control in Sunday. It will be partly cloudy and cold with a high around 24 degrees. While not a direct impact on us, a winter storm looks to affect parts of the Mid-Mississippi, Tennessee and Ohio River Valleys the day after Christmas bringing snow and possible thunderstorms as it moves through. Low pressure will develop in the southern Plains early this week and track through Louisiana, Kentucky and Tennessee by Tuesday night and Wednesday morning. While the track of this storm the past couple days has been fairly consistent with remaining to the south, there is still the potential for a northward shift which could bring some snow into parts of Illinois by Wednesday night. There will, however, likely be lake effect snow for Chicago so if you're traveling to or from that area keep that in mind. Here are two solutions from the GFS and European model for Wednesday morning. The dashed blue line on the graphic to the left is the freezing line. A general rule of thumb is any precipitation (green on the map) falling north of the line would fall as snow or a wintry mix and any precipitation falling south of that dashed blue line would fall as rain. The GFS model depicts the developing low a little stronger than the European and slightly further north/northwest. Same concept as before, any precipitation falling where there are dashed blue lines would be snow and any precipitation falling where there are dashed red lines would be rain. If the track continues to shift further north and northwest this could mean an increased probability of snow east and southeast of Rockford. Either way, travel the day after Christmas will be greatly impacted for those trying to get home - even if the storm doesn't directly impact the Stateline. On a side note: Another system worth watching will be one coming towards the end of this upcoming week; Friday and Saturday. Another low pressure system looks to develop late this week and track near or slightly south of the area Friday night and into Saturday morning. If that trend continues we may have more snow to deal with for the upcoming weekend. It looks as if the cold weather has settled in for awhile. After the first 20 days of December being above normal... way above, in fact, averaging 12 degrees above normal, the last 2 days have been cooler than normal, and it looks as if this will continue for most of the Christmas Holiday week. The normal high temperatures during the next week are close to 30 degrees, and the normal lows are in the middle teens. Tonight the temperature will drop of to near 14 degrees with light winds, and mostly clear skies. On Sunday the high will be in the upper 20's under mostly sunny skies in the morning. Skies will become partly cloudy in the afternoon. It will become mostly cloudy with a low pressure system moving from the southern plains into Arkansas. An inverted trough of low pressure extending northward from the low over southern Illinois on Monday morning could bring some light snow or flurries to the Stateline on Monday morning. That system will continue to move off to the east leaving skies mostly cloudy on Christmas Eve. The low Christmas morning will be in the middle teens. It will be partly sunny and a little colder on Christmas Day with northerly winds, and a high in the middle 20's. It will be mostly cloudy, breezy, and cold on Wednesday as a strong storm system spins up over eastern Tennessee. The high will be only around 23 degrees on Wednesday with a brisk northeasterly wind. The Canadian ridge of high pressure stretching southward across the plains will feed quite cold air into northern Illinois on Wednesday night with the low dropping to around 10 degrees, and the high on Thursday will only be around 21 degrees. The cold ridge will shift of to the east across the Great Lakes on Friday as low pressure develops over the southern plains. It will be mostly cloudy with a chance of some snow. 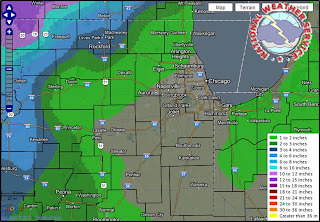 Chances of snow will continue on Saturday as the low moves northeast toward Chicago. Thursday's winter storm and Friday's cold blast help put an end to two streaks Rockford had going heading into the start of winter. The first you're probably familiar with. Our snow drought ended Thursday, after 290 days without measurable snow. That streak is the new record holder, beating our old record of 287 days back in 1922. The other record was not as publicized. Friday's high of 30 marks the first time this cool season we had a high below the freezing mark. The only time it took Rockford longer to hit a sub-freezing high was 2001. This second streak is relevant from a historical perspective. Pretty much every other year in the top five saw warmer than average temps for the rest of the winter, along with less than average snow. Will that be the case this year? Wait and see! Illinois: Northwestern Illinois saw the heaviest snow from this storm, but everyone saw at least a little bit of the white stuff Thursday. Lena in Stephenson County had the highest snow total in Illinois, checking in at a foot. Wind gusts topped 50mph in many spots, with Steward in Lee County seeing the highest gust on Thursday... 60mph. ARE USUALLY TAKEN AT 7 AM. Wisconsin: The Stateline part of Wisconsin say plenty of snow, but the heaviest totals were closer to Madison. 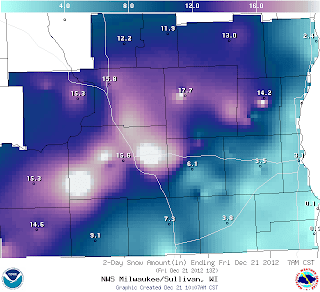 At last check, parts of Monroe and Janesville saw anywhere between 7-9" of snow. It's nice to finally be able to see some sun this afternoon! Unfortunately the view from inside is a lot better than what it is outside! Don't look for much improvement tonight, either. High pressure moving in will ease some of the wind but it is going to get cold. Overnight lows will drop between 5° and 9° with wind chills dropping near or slightly below zero just before dawn Saturday. Temperatures this weekend will remain in the 20s with a few 30s likely in areas that didn't receive much snow on Thursday. Another cold blast of air is expected by the middle of next week with several waves of energy expected to move through. Here's a look at some of the snow totals and wind gusts seen throughout the Stateline as of 11:00pm Thursday night. We'll update these numbers as we get them. 11:20am Update: Blizzard conditions are expected to move east of the Mississippi River between Noon and 2pm this afternoon and continue east towards Chicago after 4pm. Temperatures are already beginning to cool and as winds shift around to the northwest they will pull even cool air over the Stateline. A mix of rain/sleet/snow may occur before a complete change to snow. Visibility in Iowa where the wind has picked up and the snow has fallen have been reduced to les than a quarter mile and snowfall rates near 1" per hour. Again, travel will become difficult through the afternoon and evening with the strong winds and possibly icy roadways. Blizzard Warnings have been extended further east this morning to include Stephenson, Carroll, Whiteside, Winnebago, Boone, Ogle and Lee counties. These will go into effect at Noon and last through midnight tonight. Don't be fooled by the rain falling this morning because the snow will come by this afternoon. Rain will continue through the morning with temperatures beginning in the upper 30s to low 40s. As cold air wraps in from west to east the transition to snow will begin to take place during the afternoon and last through the evening. The snowfall forecast hasn't changed much from the previous forecast but I have noticed a dry-slot wrapping around the low that currently sits near St. Louis, MO. Once the low moves into Illinois around noon today there may be a lull in the precipitation before the snow begins to fall. As we've been talking about all week the biggest concern with this storm will be the wind. Sustained winds around 30-40 mph will gust as high as 50 mph through the evening. Even if a few inches of snow only fall the strength of the wind could cause near blizzard like conditions and that's why Blizzard Warnings have been issued. One concern I do have with the rain falling this morning is that when temperatures begin to drop and the snow begins to fall it could create some slicks spots on roadways. Again, look for rain to continue through noon today with a changeover to snow from west to east into the afternoon. Winds will pick up from the north and northwest with gusts as high as 50 mph which will cause lowered visibility as the snow falls. Roads may be icy late tonight and early tomorrow until the snow ends around midnight tonight. Our first winter storm of the season is on our doorstep, but it won't exactly feel winter-like at first. Here's a complete timetable of what the Rockford Metro area will experience over the next 24-36 hours. Rain moves in this evening with a few snowflakes mixing in as temps dip into the mid 30s. Temps actually warm into the upper 30s overnight, meaning all rain after midnight... maybe even a rumble of thunder. Areas to our far north and west (Iowa to central Wisconsin) will more than likely see all snow during the overnight. All this rain will eventually turn to heavy, wet snow on Thursday... starting to our west and moving east as the day progresses. For Rockford, this switchover will take place around midday. Afternoon winds pick up quite a bit with wind gusts around 50mph, which will blow around whatever snow is on the ground. This will cause limited visibilities and brief blizzard conditions through the day. A rumble of thunder is still possible through the afternoon. Heavy snow and strong winds are expected to continue through the evening. There are a number of warnings out. With the exception of some Blizzard Warnings already in effect to our west, most of these warnings do not kick in until Thursday morning. The majority of northern Illinois is under a Winter Storm Warning, with Jo Daviess and southern Wisconsin under a Blizzard Warning. Snow totals will vary, but the heaviest snow will be to our north and west. Areas under the Winter Storm Warning will generally see 4-7" of total accumulation by Friday morning. If we get any thunder, those areas will see higher totals. Areas under the Blizzard Warning will generally see 8-12" of accumulation. Isolated areas closer to central Iowa and central Wisconsin could see more. Stay with the First Warn Weather team for the latest on this developing storm! 11:45 am Update: There have been no significant changes to the forecast from earlier this morning. Winter Storm Watches have been extended further east to cover the Chicago Metro area. Precipitation in southern Wisconsin and northwest Illinois will likely already be starting off as snow Thursday morning with rain or a rain/snow mix further east and southeast. Low pressure is expected to move very close to Chicago by Noon Thursay with cold air wrapping south of the low in central Illinois. Heavy snow will continue from Monroe to west of Freeport with a transition to snow between Noon and 3pm elsewhere. Once the snow begins the speed at which the air is rising in the atmosphere behind the low will increase likely causing a period of heavy snow to fall at rates of 1" to 2" per hour for a time. This combined with wind gusts nearing 45mph or 50mph will make afternoon and evening travel very difficult. Winter Storm Warnings continue for southern Wisconsin and northern Illinois beginning this evening and lasting through Thursday evening. Blizzard Warnings have been issued for Green and Rock counties in Wisconsin and will go into effect Thursday afternoon. A Blizzard Warning has been issued for Jo Daviess County and will go into effect later tonight and last through Thursday evening. Our first winter storm will make its presence known late tonight and definitely by Thursday morning as warm, moist air drawn in from the Gulf will mix with cold Canadian air from the north. Low pressure will track from Oklahoma tonight to St. Louis, MO by Thursday morning and near South Bend, IN by Thursday night. Initially precipitation across north-central and northeast Illinois will begin as a light rain/snow mix after 4pm/5pm this evening and continue overnight. West and northwest of Rockford may experience a little more snow at the onset as temperatures will remain closer to or slightly below freezing from central Wisconsin to northeast Iowa. As the low moves northeast overnight and early Thursday morning I wouldn't be surprised if there were a few rumbles of thunder; both where the rain is falling and where the snow if falling. By mid-morning Thursday low pressure will strengthen very close to the Stateline which will cause the wind to increase and possible thundersnow to develop in southern Wisconsin and northwest Illinois. Where thundersnow is observed it's possible totals may exceed 10", but this is expected to remain north and west of the immediate area. There will be light rain mixed with snow early Thursday morning but as the low moves south of Chicago by the afternoon the cold air will move in from west to east and change any leftover rain to snow by Thursday afternoon. Snowfall totals will be less the further east and southeast of Rockford and higher the further north and northwest of Rockford. In fact, locations from Madison to Monroe to just west of Freeport to Mt. Carroll and Galena could see totals nearing 12" while locations closer to Rochelle, DeKalb and Sycamore could have totals near 4". It's important to not necessarily focus on the snow totals but the wind that will accompany this storm. The low will strengthen significantly once it moves into Illinois by late morning Thursday causing northwest winds to gust as high as 50 mph. Near blizzard-like conditions will be found from southern Wisconsin to northwest Illinois and expand east through the day and road conditions are expected to deteriorate through Thursday evening. With temperatures nearing 32° as the switch from rain to snow occurs we'll experience a heavier snow which may cut back on drifting some but where higher totals occur it could weigh down trees and power lines. Let me start off by saying this forecast can still change a little, but no matter what happens, the weather is going to create plenty of problems Wednesday night and Thursday, possibly even into Friday. Model runs are coming into agreement that Thursday's winter storm will stay just to our south. I've outlined what to expect the next couple days with our Winter Storm Impact Forecast. Things kick off Wednesday with evening showers. A few snowflakes will mix in as we go through the night. There's even enough energy in the atmosphere that we could get a rumble of thunder early on. That rain/snow mix eventually switches over to all snow on Thursday. When it switches will determine how much snow we get. The National Weather Service is expecting our precip to be all snow by late morning, although the timing could be off by a few hours. Now the big question... how much snow? Initial forecasts are showing heavier amounts staying to our northwest, but we are really close to getting some big snow totals. Right now, I'm going 4-6" in the Rockford Metro, with heavier amounts to the northwest. The biggest concern with this system will be Thursday night into Friday, as winds gusts are expected to pick up somewhere in the 40-50mph range. Because this is going to throw a lot of snow around, the National Weather Service has issued WINTER STORM WATCHES for most of the Stateline and WINTER STORM WARNINGS for Jo Daviess County and all of southern Wisconsin. If this storm moves, even a little bit, it could impact snow totals, but the strong winds are coming regardless, so be careful if you're doing any traveling the next couple days! A Winter Weather Advisory has been issued for Green, Rock and Walworth counties through this evening for the light snow that is currently falling in southern Wisconsin. A Winter Storm Watch has been issued for all northern Illinois and southern Wisconsin counties beginning late Wednesday evening and lasting through Thursday afternoon. As the morning model runs continue to come in we're beginning to gain a better idea of where exactly low pressure will move Wednesday night into Thursday afternoon. While there are subtle differences between runs and the models themselves they are starting to converge on a general track taking the low from north-central Oklahoma to northern Missouri by midnight Wednesday to northern Illinois by Thursday morning and into Indiana by Thursday afternoon. With this current track it still appears as if the heaviest of the snow will occur just to the north and west of Rockford with places like Mt. Carroll, Stockton, Elizabeth, Freeport, Monroe and Madison receiving some of the higher totals. Locations east and southeast of Rockford look to receive slightly less due to warmer air at the onset of the storm. Light snow will continue to fall north of the state line through this afternoon with quiet weather expected through tonight and the first half of Wednesday. Temperatures are expected to rise above freezing during the afternoon Wednesday so any precipitation that does fall should fall as rain before mixing with light snow by Wednesday night in north-central Illinois. All snow or a quicker transition to snow will likely occur from southern Wisconsin, far northwest Illinois and Iowa where the cold air will be in place the longest. As the low moves into Illinois it is still expected to strengthen which would increase the north wind from Wisconsin through Illinois by Thursday afternoon. We do know a transition to snow will occur mid-morning Thursday with snow continuing through the afternoon. The quicker the transition the higher the snow fall totals and the slower the transition the lower the snow fall totals. One important thing to note is that even if we receive a few inches of snow fall the strong winds will cause blizzard like conditions through Thursday evening. Travel will be impacted from mid-morning Thursday to Thursday night with some improvement in conditions by Friday morning. As we get closer to the event we'll continue with updates and be able to better pinpoint who will receive what and how much snow will actually fall. It's important to us to make sure we have the most up-to-date information to provide you with a better forecast! Evening Meteorologist Brandon Arnold will have another update and storm break down for you on the news at 5pm, 6pm, 9pm and 10pm. Winter Storm Watches have been extended further east this morning to cover northern Illinois and southern Wisconsin and will go into effect Wednesday evening. It's important to remember that even though the watch has been extended further east it doesn't necessarily mean we'll get a lot of snow. At this point it still looks like the heaviest snow band will fall just north and west of Rockford. However, if the track of the low shifts a little further south then the heaviest snow band would be shifted further east and south. If you saw today's forecast, you know a big storm is looming on the horizon, but what we see will depend almost solely on how the storm moves. Since the forecast can still change, let's talk about some of the scenarios we could see with this next system. Model runs are showing two general paths the storm could take. Some models, like the GFS and NAM, are tracking the storm right over Rockford or just to our north. The European model is breaking the trend, keeping the storm south. It's important to note here that the European model has been very consistent in forecasting the path of past storms. 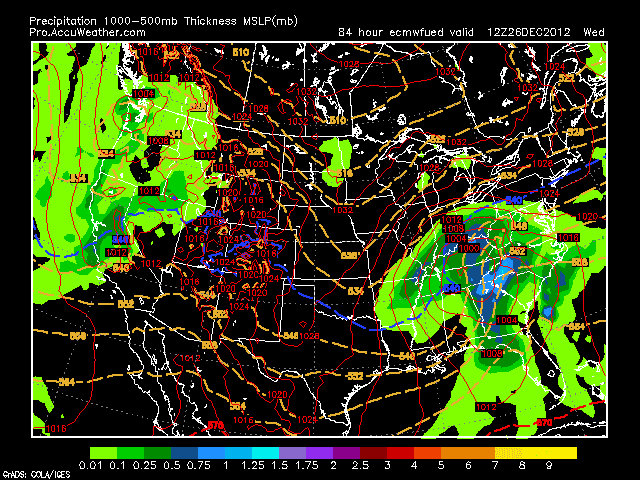 In my professional opinion, I'll side with the Euro over the other models almost every time. Those two potential paths mean two very different things for the Stateline, especially Rockford. If the GFS and NAM hold, the forecast would look like this: A rain/snow mix for Wednesday night and a good chunk of Thursday, with a changeover to snow later in the day. The warmer air that would be pulled in with a northern track would mean less accumulating snow, although some snow on the ground by Friday morning is still a decent bet. If the European model holds true, we'll be talking a blast of cold air much earlier on Thursday, meaning a lot more snow. But the question is how much snow? It's almost impossible to tell at this point, but the heaviest snow totals are always to the north and west of these storms. Knowing this, the National Weather Service has already issued WINTER STORM WATCHES for parts of Wisconsin and Iowa. That watch also includes Jo Daviess County. This is a good indicator of how close we'll be to some big time winter weather. Could this next storm be the one? 11am Update: The latest morning runs of the NAM and GFS are beginning to come in. From last night to this morning the NAM has shifted the track of the low further south from its previous position (which had it moving through the Quad Cities to Dubuque with all rain falling). If this track were to verify precip would begin as rain Wednesday night with a change over to snow Thursday. The American GFS has maintained its track from Sunday evening but has had a slight shift further west. This, too, would keep precip in the form of rain Wednesday night with a possible mix or change over by Thursday afternoon. Bottom line, the highest snowfall totals will occur where snow falls during the whole duration of the storm and that might just be north and west of here. It will interesting to see the morning run of the European model. I wouldn't be surprised to see that shift further north as well. Sunday tied the record for the longest stretch without measurable snowfall in Rockford...a whopping 287 days! The previous record was set back in 1922. Another snow less day is expected this afternoon so look for that old record to be surpassed, although, we may not remain snow less for long. A few systems moving within the jet stream will traverse across the Midwest today and tomorrow but the one that has everyone asking "Will this be the one?" is now just moving onshore in the Pacific Northwest and is expected to be here by Wednesday night. Even though Wednesday night doesn't seem that far away there remains a bit of uncertainty as to where exactly this storm system will track. After all, a matter of 50-80 miles north or south would be the difference between a foot of snow or an inch of rain. Before we get too excited about this next system I want to break down a few of the possible tracks and scenarios that may play out by Thursday night. With this storm just beginning to move onshore there will be shifts in the track until it's sampled for about a day or so with the upper air network. In fact, we've already seen a shift in the track within the past 24 hours. The majority of the reliable weather models we look at have a general track from around Oklahoma to central Missouri by Wednesday night to central Illinois by Thursday morning and into Michigan by Thursday night. Usually the band of heaviest snow will fall just north of where the surface low tracks and with this projected path it would place areas from Des Moines, IA to Freeport, IL to Madison, WI in a swath possible to receive nearly six inches of snow! East and southeast of the track a rain/snow mix or just rain would fall leaving snowfall totals a little less near Chicago. It's important to look at what will occur at the surface but to gain a better understanding of the storm system we have to look at what's occurring above our heads. A dip in the jet stream out west will allow for not only a surface low to develop in the central/southern Plains but also an upper level low in the southwest. This low will become a closed circulation as it moves northeast into the Great Lakes. When we see this happen in the flow aloft it means the low will strengthen as the jet stream develops a negative tilt and will usually slow down. As is typical with systems that slow down we usually tend to see a slight shift of the surface low to the north and west; which was already observed from the American GFS model from Sunday morning to Sunday night as well as a slight shift north from the European model. So I wouldn't be surprised if this general trend towards a more north and west track continues. To also aid in trying to forecast potential significant storm systems we look back at previous events that have had a similar track as to the one we're expecting. 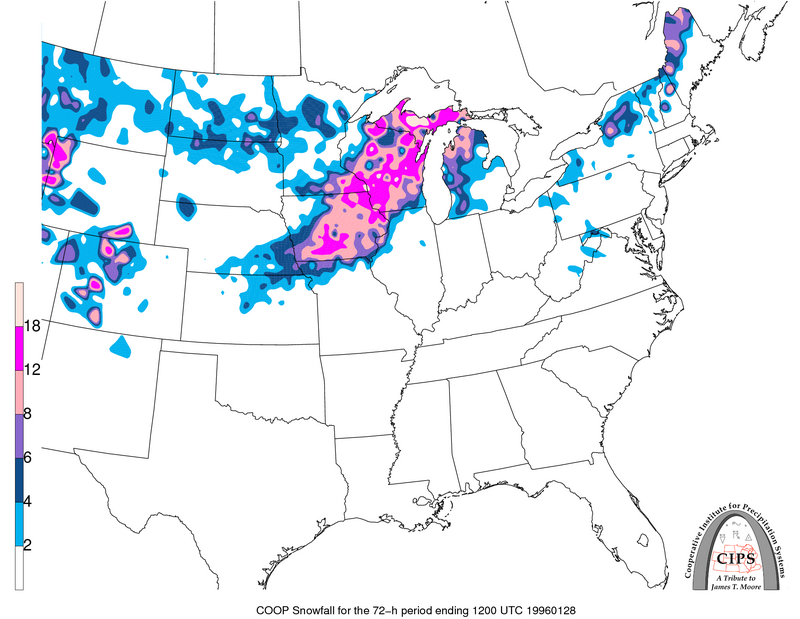 One such past storm occurred back on January 1996 which dumped a significant amount of snow from Iowa to southern Wisconsin while northern Illinois received only a few inches. Should the track of this storm shift further north and west the heaviest snow band would shift as well and further away from the Stateline. By Tuesday morning we should have a pretty good idea of just where this low will track and how much snow or rain we should receive. Stay tuned! Sunday was a drab day across northern Illinois. Weak weather systems dominate the weather picture, so the clouds are stubborn, and will continue to be overnight, and on through the day on Monday. As of 10 pm CST the temperature has been stuck on 38 degrees for 8 hours in a row at the Rockford airport. With that in mind I don't think it will get as cold tonight as I thought earlier. Instead of the upper 20's for lows tonight, I think the temperature will have a difficult time falling below 32 degrees all night. The wind will be light tonight and tomorrow, and the high on Monday will be in the upper 30's. Every day this month has been warmer than normal. The weather has been mild so far in December with the temperature averaging a little more than 12 degrees above normal. That is a big differential. It will not last because there is colder weather on the way for the end of the week through the weekend. Little if any precipitation is expected through the daylight hours on Wednesday. High temperatures will run from the upper 30's into the low 40's, and lows at night will be in the upper 20's to low 30's. Things start to get interesting on Wednesday.... Low pressure starts to pull itself together over the panhandle of the southern plains. A strong surface jet is in place from the southern plains northeast across southern Missouri, southeastern Illinois, into Michigan. The low will have plenty of cold air to the north, and plenty of warm and humid air from the Gulf of Mexico to the south. The intensifying winter storm is expected ride the thermal boundary to the northeast in an almost ideal path (for producing heavy snow for the Stateline) across southern Illinois across east central Illinois into Michigan on Thursday. It's a little early to call for snow fall totals while the makings for this storm are still off the Pacific NW coast, but the models have been pretty good lately on predicting major storm developments. It is possible that this whole system may fizzle and never develop, but right now it looks like 4" to 8" of blowing and drifting snow is possible by late Thursday. The precipitation will probably start as a rain and snow mix on Wednesday night, and change to all snow before daybreak on Thursday. It will snow all day on Thursday, and gradually diminish to flurries on Thursday night. The wind will gust to 35 mph, and possibly higher, blowing the snow around, reducing visibilities making driving difficult. The high on Thursday will only be around 32 degrees, and the low Thursday night will be in the upper teens. The rest of the week will be cold with below average temperatures. Low pressure located near La Crosse, Wisconsin will move to Green Bay by Sunday evening and continue northeast into the UP of Michigan on Monday. It will be cloudy overnight with some light rain possible. No measurable rainfall is expected. Temperatures will remain fairly steady with a low in the middle 40's. On Sunday the drab weather will continue with clouds and a chance of a little light rain in the morning. The high temperature will be in the middle 40's. It will be mostly cloudy and cooler on Sunday night as winds swing around to the northwest dropping overnight lows down into the upper 20's. Cold surface high pressure will be in place over the central plains on Monday. An upper level disturbance passing over central Illinois on Monday afternoon could scatter some light rain showers or sprinkles into the Stateline on Monday afternoon. It will be cooler, but still above average with highs in the upper 30's. Skies will be partly cloudy, and it will be a little colder on Monday night with lows in the middle 20's. Another disturbance could cause some rain or snow showers on Tuesday afternoon, but any precipitation should be minimal. On Wednesday the high pressure ridge will be well to the east of the Stateline. A storm system looks like it will beginning to put itself together over the Texas/Oklahoma panhandle area on Wednesday morning. It will be partly sunny across northern Illinois with a high around 40 degrees. The low will track toward the east on Wednesday night. It will become quite intense with strong winds, and rain or snow will develop on Wednesday night. Right now it appears as if the low will track into central Illinois by 6 am on Thursday morning. If it travels just a little bit further south, the Stateline looks like it could be in for a heavy snow storm. With the track through central Illinois it looks like a rain/snow mix gradually changing to all snow as the storm pulls off to the northeast on Thursday afternoon and night. Friday will be partly sunny, windy, and colder with a high in the middle 20's. Saturday will be a cold day. The low in the early morning will be around 12 degrees, and the afternoon high will be around 24. While rain falls this morning and afternoon we're already eyeing another significant storm system that could impact the Midwest and Great Lakes by next Thursday and Thursday Night. Even though it's several days out, low pressure looks to develop near the panhandle of Oklahoma and lift north of Springfield Missouri by Wednesday evening and then north of St. Louis, MO to just south of Chicago by Thursday evening. A swath of heavy snow will likely fall somewhere from Iowa, Illinois, Wisconsin to Michigan by Thurday night. It's just a matter of where exactly that band will be. 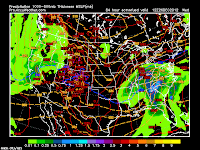 The first image on the left is a snap shot of the European model for Thursday at 6pm. If this were to hold true precipitation would initially begin as a mixture of rain and snow late Wednesday night into Thursday morning. 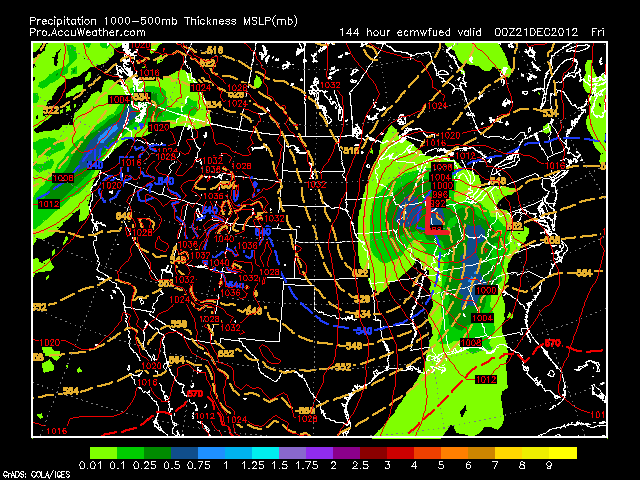 As the low passes near Chicago a possible change over to heavier snow would occur from northwest to southeast. 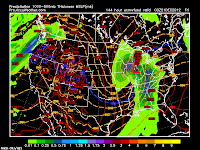 The second image is a snap shot of the American GFS model during the same time period. It also has a strengthening low developing by Thursday evening but it's shifted a little further northeast. A shift in either direction would mean a big difference in precipitation type and accumulation. We'll continue to analyze each model run as they continue to come in this weekend and early next week and provide the latest updates right here as shifts in the track and intensity are to be expected. Everyone hoping for a White Christmas will not be happy with this weekend's forecast, but local farmers will be ecstatic. We may not talk about it as much now that the harvest is over, but the Stateline's ongoing drought is still a big problem. 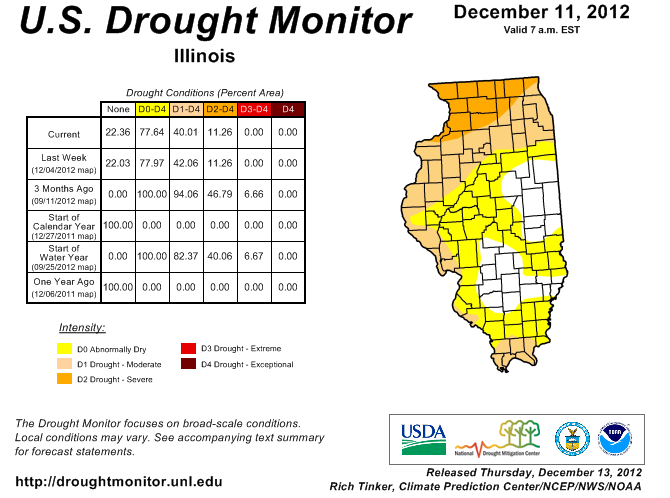 Here's the latest drought monitor from Tuesday, Dec. 11th. 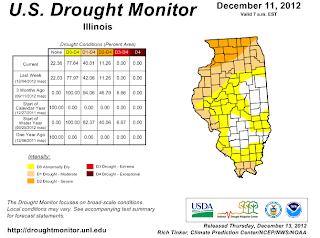 As you can see, the Stateline is still classified under a severe drought. This is important because farmers still need moisture over the winter months to make sure the ground is ready to go when planting season arrives in the spring. This weekend's storm system is now being forecast as an all rain event. Rain moves in after midnight on Friday, and continues throughout the day on Satuday with a few lingering showers possible Sunday morning. Our in-house models are showing a good 0.50" of rain possible with this system, but that is quite possibly on the low end of what we'll actually see. The National Weather Service is predicting up to an inch of rain possible this weekend for parts of the Stateline! This won't be enough to break our drought, but it's definitely a step in the right direction. And for everyone hoping for a snowy holiday... don't panic just yet. Some models are suggesting some accumulating snow sometime near the end of next week, which is continued great news for our drought. For farmers, precip is precip! Added Bonus For Stargazers Tonight? Signs of a Mild Winter? Hope For Breaking Our Snow Drought? How Much Snow Are We Getting? The Sun Makes All the Difference! What a Way to Start December!